The pumpkin is an autumn fruit that is a popular culinary ingredient. It is most often associated with Halloween, a popular holiday in North America and other parts of the world. The pumpkin plant, thought to originate from North and Central America, has been used for its medicinal and nutritious benefits for centuries. Nowadays, pumpkin is most commonly associated with Autumn celebrations. The carved pumpkins are Halloween's signature decorations, and the pumpkin pie is arguably the most traditional Thanksgiving dessert. Keep reading to learn more about the medicinal benefits, botanical characteristics, history, and many uses of this versatile fruit. Treating common skin conditions. Pumpkin has been traditionally used to treat burns, sores, and blisters, as well as for healing wounds. Promoting heart health. Because pumpkins are rich in Omega-3, they contribute to keep cholesterol levels in check and lower blood pressure. Reducing benign prostate enlargements. 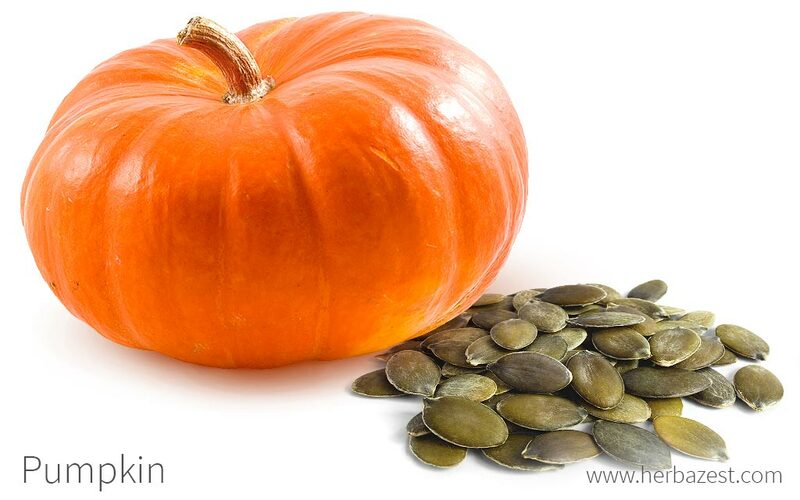 Pumpkin seeds have been traditionally consumed for preventing and treating prostate problems. Additionally, the consumption of pumpkin is recommended to relieve the symptoms of Irritable Bowel Syndrome (IBS), as well as for maintaining eye health. The cucurbitacin in pumpkin seeds also helps repel intestinal worms. A major compound in pumpkin is cucurbitacin E, a triterpene with strong antioxidant and anti-inflammatory properties. It is mainly contained in the seeds and has been shown to inhibit cyclooxygenase-2, an inflammatory protein related to a number of health conditions, including Benign Prostatic Hyperplasia (BPH). Other powerful anti-inflammatory compounds in pumpkin are selenium, Omega-3 fatty acids, and sterols, all of which also contribute to prevent cardiovascular diseases by reducing cholesterol levels and lowering blood pressure. With its high levels of beta-carotene pumpkin offers protection against many diseases, as well as many of the degenerative aspects of aging, including skin damage and eyes health. Beta-carotene not only has a strong photo-protective action that helps prevent the damage caused by ultra violet radiation, but it also promote the natural formation of collagen. Pumpkins are also rich in potassium, fiber, and vitamin C, and therefore help promote healthy heart and kidney function. Peppermint and cardamon also help reduce inflammation, and similar cardioprotective benefits can be found in herbs like olive and quinoa. No side effects or drug interactions have been reported regarding to regular consumption or proper therapeutic doses of pumpkin (Cucurbita pepo). However, the over-consumption of bitter-tasting squashes - with higher levels of cucurbitacin - may cause diarrhea and dehydration. There are many ways to incorporate pumpkin into a healthy diet. Most usually consumed as food, pumpkin can also be found as a supplement, which concentrates its medicinal benefits. it is possible to dehydrate the fruit for long term storage, or buy it canned. Cooked. The soft texture and mildly sweet taste of pumpkins makes them a popular ingredient in many dishes, from soups to flans to breads. Pumpkin flesh is rich in beta-carotene and have anti-inflammatory properties. Roasted. Traditionally, pumpkin seeds have been roasted and consumed as a snack. In this form, pumpkin seeds can help reduce cholesterol and blood pressure levels, as well as boost cardiovascular health. Liquid extract. Pumpkin seed extract may also be combined with cranberries in some supplements for the purported benefit of improving urinary tract health. Oil. The cold pressed seeds of pumpkin produce an omega-3-rich oil that can be consumed every day in order to prevent cardiovascular diseases. Capsules. For medicinal purposes, capsules containing pumpkin seed oil are available. Pumpkin is cultivated around the world and is commonly seen in most grocery stores or local markets in autumn-time. Pumpkin sold for decorative use will most often be spherical in shape, but other shapes can be found and are sold for the purposes of cooking and eating. Dehydrated and powdered pumpkins are not as common, but can be found in specialized health stores and online. The seeds are also available to buy separately, either shelled or unshelled. Pumpkin seed oil is not hard to come by, and can be found at some organic stores, as well as in specialized herbal stores and online retailers, as gel capsules or as pure oil. Available in a wide range of sizes and shapes, pumpkin can be easily cultivated in a home garden. However, it should be kept in mind that the vines need room to spread out up to 15 feet (4.5 m). Pumpkins need to receive full sun and good drainage for optimum growth; with too much water, root rot could occur. Pumpkins grow best in moderately to slightly acidic soil. The ideal temperature for germination is be between 77 - 86°F (25 - 30°C) and the seeds should be planted after the last frost. Pumpkin seeds should be sown about two inches (5 cm) deep, roughly in the center of where the vines are expected to spread. The plants should be watered deeply but not too often. More detailed information about growing pumpkin can be found in the herb garden section. The pumpkin plant can bear a fruit of up to 66 pounds (30 kg), which can be anything from spherical to very long in shape. The fruit is normally orange in color, but other colors are possible. As well as the edible fruit, the plant also produces attractive yellow flowers and lobed leaves, which grow on its twining stems. Pumpkin, or Cucurbita pepo, is a member of the Cucurbitaceae family; which comprises about 990 species, including cucumber and melon. The genus Cucurbita, exclusive from the New World, includes over 27 species, including a variety of squashes, gourds, and pumpkins. The three recognized subspecies of Cucurbita pepo are C. pepo subsp. fraterna, subsp. pepo, and subsp. texana. Within these, there are countless varieties and cultivars, many of which have been manmade and some of which have developed in the wild. The most commonly cultivated subspecies is pepo. The origin of pumpkin is obscure and there is some debate, although it is generally thought to hail from somewhere in the Americas. PUMPKIN IS THOUGHT TO BE ONE OF NORTH AMERICA'S MOST ANCIENT DOMESTICATED PLANTS, WITH THE OLDEST KNOWN LOCATIONS IN MEXICO CLOCKING IN AT ABOUT 10,000 YEARS AGO. Archaeological evidence suggests that the Aztecs used to snack on pumpkin seeds, meaning their nutritious benefits have been of historical importance as well as their medicinal properties. Historically, it has played an important role in healthcare. The Mayans applied the sap to burns, the Menominee people recognized and used the seeds for their diuretic properties, and European settlers created an effective worming remedy, by mixing the seeds with water, milk, or honey. Today, the pumpkin is commonly associated with jack-o'-lanterns and the Halloween holiday, but it is also widely used as a culinary ingredient. China is the world's leading producer of pumpkins and squashes with seven million tonnes per year, and worldwide, a massive two million hectares of land is dedicated to growing them. Decoration. Because of the tough outside and soft inside, pumpkins can easily be scooped out and carved into the exterior, creating jack-o'-lanterns to celebrate Halloween. Personal care. Additionally, both extract and essential oil of pumpkin seeds boast emollient and antioxidant properties, and are used in the cosmetic industry as ingredients for facial moisturizers, hair conditioners, shampoos, lip balms, foundations, and anti-aging treatments.